It’s spring… or is it? While it’s definitely springtime according to the calendar, the weather lately (at least here in Chicagoland) has been anything but warm and welcoming. As in, there is snow on the ground, and I had to scrape snow and ice off of my windshield this morning. What kind of spring weather is that? Sadly, for spring in the Midwest (and, I’m guessing, a lot of other places too) that’s the rule rather than the exception for this time of year – it’s cold until it’s blistering hot, probably around May or so. This weird transition period between winter and summer can be SO hard to dress for, but we’re about to make it a little easier for you. Two words: spring sweaters! Whether you want to grab a hook to crochet a cozy sweater or knit an beautiful new sweater, we have patterns for you. These 20 free sweater patterns are all lightweight and breezy, making them the perfect wardrobe piece for this time of year when the sun is hot but the temperatures are still low enough to warrant a coat. Lightweight yarns and large stitches make these sweaters not as chunky as their fall and winter counterparts, but they’re still warm enough to cut the chill when it’s not quite time to bust out the shorts! I’ve included crochet sweater patterns and knitted sweater patterns, and none of them is super complicated so no matter what your yarnie skill level, you should be able to figure it out. My personal favorites are the open-stitch tunic-style sweaters – they’d make for a great beach coverup during the summer time, too! 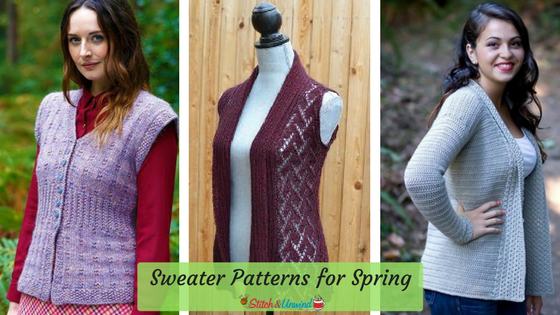 You’ll want to grab your crochet hooks and get to work on these amazing spring sweater patterns! 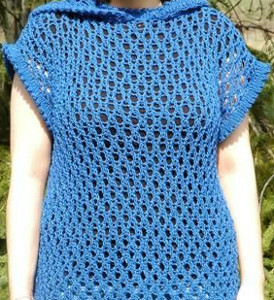 From cardigans that can be worn over your favorite cocktail dress to a light sweater featuring lace, you’ll love the following assortment of crochet sweater patterns. Many of these crochet patterns use yarn in light weight, so you can work up a sweater that’s stylish without feeling stifling. Think of knit sweaters, and you likely think of items made with bulky yarn in drab colors. We promise that these spring sweater patterns are anything but dreary! Featuring light yarn in an assortment of bright colors, these knit sweater patterns will be perfect to wear in spring. What do you like wearing in the spring?